Dr. Rolph Payet has a 26-year career spanning academia, government, NGOs, politics and international governance. He has received numerous international awards and recognition for his work on islands, oceans, climate change, tertiary education and biodiversity. He was the first President and Vice-Chancellor of the University of Seychelles, and Minister of Environment and Energy in the Cabinet of Seychelles from 2012 to 2014. He was appointed in October 2014 by the UN Secretary-General to lead the Secretariat of the three principle multilateral agreements on chemicals and waste. A. MEJÍA: When one thinks of environmental issues and global challenges, chemicals and waste do not necessarily come immediately to mind, and yet we all inherently understand that hazardous and toxic substances are a threat to human health and environment. How can you overcome this, essentially to make the invisible, visible, in order to mobilize attention and efforts at the international level? ROLPH PAYET: This a daunting challenge, because chemicals and wastes are not something that people immediately relate to. However, when you talk about mobile phones, cars, furniture, food, they relate to this. They think of chemicals as someone in a lab-coat – a scientist. So that is the first problem. The second problem is, when you talk about waste, people think it is not their issue – this is an issue for the garbage collectors! Waste is something people, even politicians, don’t usually want to talk about, and in some cultures waste is seen as taboo. So, you have this double complexity there. The challenge, therefore is how you convert this narrative, into real life stories… connecting the intangible with tangibles, things around us. So, how chemicals are connected to food, connected to your mobile phone, and so on… Most dramatic is how chemicals are connected to your life. Newborns are important to mothers and fathers alike, we pay so much attention to childcare, so when we advocate breastfeeding, of course the milk needs to be healthy and not contain toxic chemicals. With this narrative, mothers become more concerned about what they are consuming, what they are eating, what they are being exposed to, and through the Stockholm Convention’s Global Monitoring Plan we have discovered that in many countries the level of toxic chemicals in breast milk is a cause for concern. In using a human story of a mother and a child we can communicate to society in a more helpful manner. So, focusing on human stories has been our strategy to raise awareness, even among policy makers. Yes, make it more visible. Unless the whole of society understands, it’s very difficult. One issue which is constantly in the news right now is marine litter, with almost daily images of our oceans awash with plastics, or of wildlife dying from plastic and other pollution. How do the three conventions relate to marine litter and microplastics? You won’t believe it. Scientists have been talking about this for more than 50 years, around the time I was born. When I graduated from university, and that is way back in 1992, I applied for a research grant to study plastic debris on the uninhabited outer islands of the Seychelles. Where was this plastic coming from? And then when I attended a conference in Miami, it was the umpteenth global conference on marine debris, I shared my research and discovered that like-minded scientists were highlighting this over 30 years ago. Climate change and other global phenomena are subject to this same agnostic response despite clear scientific evidence. That said, I am indeed very motivated that we now have this opportunity to turn the tide on marine plastics so to speak. Marine plastics might be thousands of miles away, but their origins are a result of our actions, our consumption, our shortsighted actions. However, let me be clear to say that the problem is not plastic per se, as plastic is often useful and indeed critical in many applications. The challenges are rather with the amount and kind of wastes we generate and in the ways we manage them, especially disposable – or single-use – plastics. In our pursuit for development we have become a throw-away society, with little understanding that resources are limited, or indeed that waste can have monetary value. Where do the international conventions come in? It should be obvious, as we have failed as individual nations to tackle the issue of marine plastic litter, that we need international action, and fast. The Basel Convention in its preamble already sets the stage for dealing with hazardous wastes and other wastes that move between boundaries, and in Article 15 makes explicit reference to the marine environment. So my endeavor is to work with Parties and the wider community, to put in place an action-oriented mechanism to reverse marine plastic litter. There has truly been a huge wave of commitment from all parties to the Convention, and, in fact, last month during one of our intersessional meetings, the government of Norway tabled two proposals to concretely address the issue of marine plastics, within the Convention. Whilst there was broad support, the Parties will need to hammer out the details at our upcoming Conference of the Parties in April next year. So, these are very concrete steps, which can be used, together with UN Environment and other actors and with other initiatives, to tangibly reverse this trend. Of concern, and this is yet to be confirmed by researchers, is the potential contamination of our food with chemicals leaching out of the degraded plastics in the environment. Many of these potential chemicals are considered under the Stockholm Convention as being accumulative in our food web, suffering long range transport and persisting in our ecosystem for long periods of time. Which implies we have in less than a hundred years gone full circle: our waste, and chemicals from that waste, can now be increasingly found in our food. Aha yes. We work in a matrix environment and in many cases with established processes, and with minimum hierarchical interventions. I feel very fortunate that I can devote my focus to moving those issues forward and interacting in a proactive way with the Parties and other partners. o, the three conventions are important. The conventions are legally- binding, and also provide opportunities for countries and the private sector to innovate and develop sustainable green products, adopt a life-cycle approach to products, and engage in sound waste management. The overall objective remains to make our planet cleaner and our people healthier. It is never too late to do what is right, and countries know that! The challenge is to convert the issue of chemicals and waste to stories that put the human at the center. This is a good moment to tell you that in the Geneva international community the BRS Secretariat has achieved a very good reputation. A very efficient, professional entity, and with a large mandate. How many people are working at the Secretariat? Thank you, this is the result of the work of the excellent team that I have in the Secretariat, and the support of our donors and contributions of our many partners. Our staff here is between 40 and 50 dedicated professionals. Congratulations, leadership is also very important. Now, the Basel, Rotterdam and Stockholm conventions have 186, 160 and 182 Parties, respectively. That’s almost universal coverage. How does work undertaken by Parties to implement these three conventions relate to, or underpin, the Sustainable Development Goals? Well, we benefit from having so many governments that are concerned about the three conventions, even though these topics are not always politically attractive. 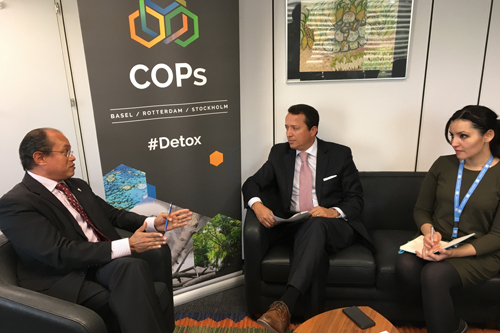 For example, at the last meetings of the conference of the parties (or COPs) in 2017, more than 100 ministers from around the world attended, sending a very strong message to my team and I. I am grateful that many of these ministers talk about SDGs and indicate how chemicals and wastes are intrinsically linked. It is an amazing prospect to have made such progress in garnering such high-level political commitment. The SDGs represent a significant opportunity for us to exploit the links, synergies, nexuses and complementarities between economic development and environment, without forgetting the social aspects. Maintaining the big picture can in the end help us to save the planet and the individual at the same time. Global agreements help us in monitoring our progress, agree on what actions to be taken and when. When we talk about chemicals and wastes, we should indeed be talking about food, water, jobs and indeed poverty alleviation! All SDG topics. Do you also engage in the field, do your people go to the field, to see examples like the one you are telling me about? Yes, we do but in a limited way because we are a small Secretariat. However, Parties have created a global network of regional centers. There are 27 around the world – they work with counties, they are our frontline organizations and they make a big difference in reaching local levels. They are our living “tentacles” in all countries. One of my priorities when I joined the Secretariat was to strengthen their work – because I felt this was the way to create the most impact and also to learn the most. I am happy to hear that because as you know, at the UN, we like to create partnerships – and I am sure this leads to partnerships. Now, coming from The Seychelles, from a “Small Island Developing State”, please tell us how your career brought you here, to Geneva, to the UN, and are there advantages to being located in this city, when thinking of implementing actions around the world to protect human health and the environment? First, when you grow up on a distant island, you feel isolated but as you become more aware you realize you are so close to the rest of the word. Take marine plastics for example. I saw it firsthand on my islands and found out it came from Africa and from Asia, transported across the oceans for thousands of kilometers. So, we are not an island, we are part of the world! Secondly, when you live on an island, when it rains, within minutes, you see the effect on the coastal area. So, when there is pollution in the mountains, you immediately see it downstream, on the coast. These island insights have helped me to make connections between human activities and the resulting impacts. So our people are disconnected between their actions and the result, and this is the problem with chemicals and waste, particularly waste. Today we generate waste and we put it in our bin in our kitchen, we put it outside and expect someone will pick it up. You know what happens to it? We don’t know. Exactly, today, some of that waste ends up in West Africa. Did you know that only about 20% of electronic wastes are documented to be recycled in proper facilities, and here we are talking about millions of tons? Do you know where your discarded mobile is? Most probably it is in the hands of a young boy in West Africa, with no job. Since mobile phones have gold and other precious metals in it, he might burn it to get the gold to sell in exchange for food. In that process he has inhaled a concoction of toxic chemicals and released other chemicals into the atmosphere, the soil or the marine environment. What is the health cost to that boy, to that country, what is the cost to our environment? I hadn’t seen that island perspective, and it is quite unique and revealing. Now, the contrast between the beautiful Seychelles and Geneva is quite a drastic change. Do you see advantages to being in Geneva? I was deeply influenced by Jane Goodall whom I met many years ago: she told me she spent her lifetime working with chimpanzees and at 60 she realized that by staying with them she was not going to save them. To save them she needed to engage with policy-makers at the global level. Staying on my island was not sufficient for me to change the world. Geneva is an important city because it convenes a significant proportion of the international community, including especially a host of influential organizations also working – like the Secretariat but in differing spheres – on sound management of chemicals and waste. And indeed our host, the Swiss government, remains very committed and supportive. We have only one planet. Lastly, what secrets to a successful international career can you pass on to young people here, or at home, who might have ambitions to work for the United Nations one day? Are there key features or motivations you would look out for, in your colleagues and in your team? First, this is not a job, it is a passion. Yes, we have challenges as an organization, but on the flipside if we stick our necks in the sand – then who will fight for the weak, for the unspoken, for those affected by our action? Who? Who will represent the planet? I also learned a lot growing up in the Seychelles from the local people. They have so much to teach us. So, learning is my second secret. Learning should never stop! And finally, one has to have a clear vision, be able to share that vision, and in sharing that vision bring people together to be able to bring change, that is fundamental. Along the way, perseverance is important: remember 30 years for global attention on plastics! Some say that the UN is a very slow organization, however some will tell you slow cooking is good when compared to fast food! In the UN we try to hear and to listen to everybody, so that no one is left behind. That’s our calling! Thank you for sharing this advice and wisdom with younger people. These words will resonate with them. I sincerely thank you for this interview. For more on the work of the Basel, Rotterdam, and Stockholm conventions see www.brsmeas.org or follow the Secretariat’s Twitter messaging on @brsmeas.